Yesterday, I posted a piece on my blog (http://barbarikon.blogspot.com) that may be of interest to readers on Brown Pundits as well. So, at Zach's suggestion, I am posting it here as well. If the exhortation to pity the nation that forgets is own history is taken seriously, few nations are more pitiable than Pakistan today. Occupying one of the most historically rich pieces of land on the planet, modern Pakistanis go about their business oblivious to the echoes of the past that swirl all around them and the layers of history that lie buried under their feet. And more’s the pity for a better understanding of this historical past could explain a lot of the present and its problems, and perhaps even help solve them. One of the most interesting and least understood periods in the history of the region is the time between 711 CE and 1200 CE, i.e., from the time when the first Arab conquerors under Muhammad bin Qasim established the so-called Emirate of Sind to the end of Ghaznavid rule in Punjab. One reason why this period is of special significance is that it represents the first extended encounter between Islam and the religious traditions of India, notably Hinduism (Buddhism too, but more on that another time). Given how the interaction and conflict between these two traditions has shaped – and continues to shape – the history of the region, looking back to the earliest encounters is especially important. Though not studied as intensely as some other periods, the history of the early medieval period in Northwestern India has attracted its share of scholarship, from the contemporary writings of Al-Biruni, Al-Maqdisi and Ibn Hawqal to the work of modern historians such as Romilla Thapar1, Finbarr Flood2,3 and Derryl MacLean4. These works describe a fascinating process of interaction, integration and antagonism between two great cultures in an ancient land. In this piece, I will only consider a narrow but interesting set of issues, motivated, as often, by a coin in my collection – a bilingual Ghaznavid dirham circa. 1128 CE, shown below. The silver coin was minted in the name of the greatest ruler of the Ghaznavid dynasty, Mahmud, who is famous – at least in South Asia – for his repeated attacks on India and his destruction of the great temple at Somnath in 1024. While his attacks ranged over large parts of northern India, Mahmud annexed only regions that lie in modern Pakistan. The coin was struck in 419 AH (1028 CE) at Lahore, which was then known as Mahmudpur – itself an interesting bit of historical information (the name “Mahmudpur” can be read clearly in the margin of the image on top at the 6 o’clock position). The complete inscription in the margin reads (as far as I can reconstruct it from this and other similar coins): bismillāh zuriba hādha-al dirham mahmudpur tis’a ‘ashra wa arba’ mi’ah (In the name of Allah. This dirham struck at Mahmudpur 419). The central text on this side of the coin reads: lā-ilāha ill-allāh / muhammad rasūl-ullāh / yamīn-ud dawlah / wa amīn-ul millah Mahmud (There is no God but Allah / Muhammad is His messenger / protector of the state / and custodian of the community Mahmud). The inscriptions at the 12 o’clock and 9 o’clock positions together read al-qādir billah, which was the name of the Abbasid caliph in Baghdad, to whom Mahmud nominally professed allegiance (more on this below). Even more interesting is the reverse side of the coin, shown on the bottom. The text is in Sanskrit, written using the Sharada script, which was used throughout the region at the time and is the ancestor of the Gurmukhi and Kashmiri scripts. 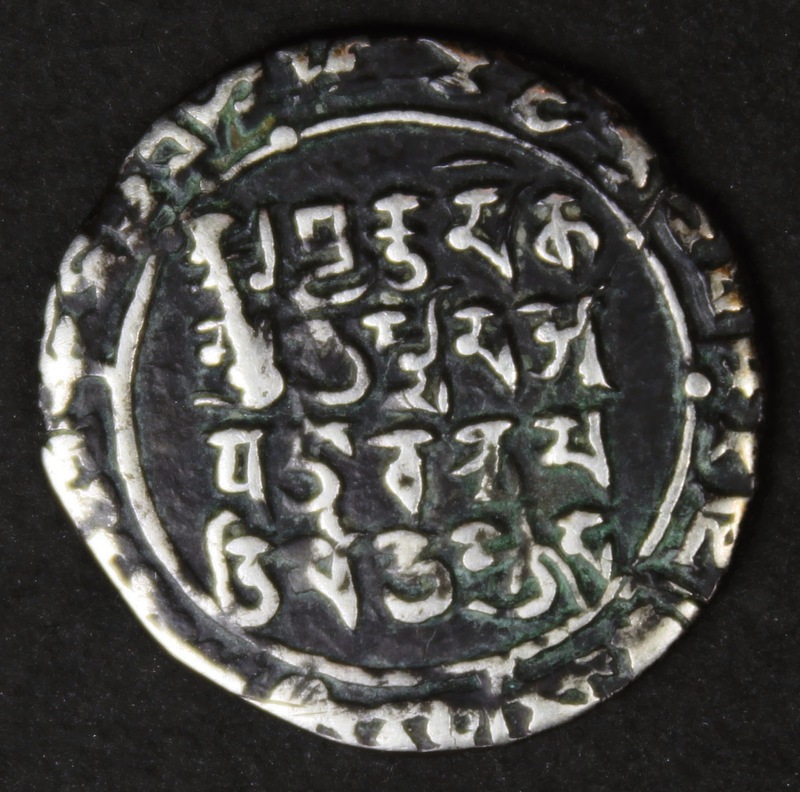 The text in the margin declares that the “tanka” – the Indian equivalent of the dirham – was struck in Mahmudpur on the given date, but it is the central inscription that is most interesting. The text reads: avyaktam ekaṃ, muhamadaḥ avatāraḥ, nrpatiḥ mahamudah. This translates as: The Invisible is one; Muhammad is His manifestation (avatar); Mahmud is the king. The margin also has a Sanskrit translation of the statement about the mint and date, including the Arabic bismillāh (in the name of Allah) translated as avyaktīya nāme (in the name of the Invisible). I rely on the reading reported by Flood in Objects of Translation: Material Culture and Medieval “Hindu-Muslim” Encounter3 (with citations to several other works), but also given by Thapar in Somnatha: The Many Voices of History1, and other sources, such as the entry for coin number 39207 in the Zeno Oriental Coins database and CoinIndia. This inscription, which is the first known “official” translation of the Muslim declaration of the creed (shahada) into Sanskrit, is interesting for three reasons. First, the very fact of putting a Sanskrit version of the shahada on a coin signals a certain outreach to the conquered Hindu population. After all, they were the only ones who would be expected to read the Sanskrit version. Perhaps there was also an element of proselytization in the move, trying to acquaint Hindus with the basis of Muslim belief. In any case, it was a remarkable acknowledgement of the need to communicate across communal lines. Second, the exclusive Islamic declaration, “There is no God but Allah” is translated as “The Invisible is one” (or sometimes as “the Unmanifest is one”), which excludes nothing. Indeed, it is best read as an affirmative statement declaring the unity of all that is ineffable and immaterial – the great world spirit, so to speak. For Hindus who believed in the undefinable, unchangeable reality – Brahman – at the core of everything, this would not have been a stretch at all. This is especially so if MacLean is correct and the major form of Hinduism prevalent in the area was Pasupata Saivism with its strongly monotheistic beliefs. Finally, the most remarkable aspect of the translation is the declaration that the Prophet Muhammad is a manifestation (avatar) of God – not a messenger, as Muslims believe. From an orthodox Islamic viewpoint, this is a heretical statement, but there it was on the coins of that most pious protector of Islamic orthodoxy, Mahmud “the idol-breaker”! It is worth noting that, as far as is known, these bilingual coins were issued only at Lahore, and only for two years (418 and 419 AH). In an end note, Flood (p. 279) quotes Tye and Tye 5, as suggesting that these might have been fiduciary coins for local use. 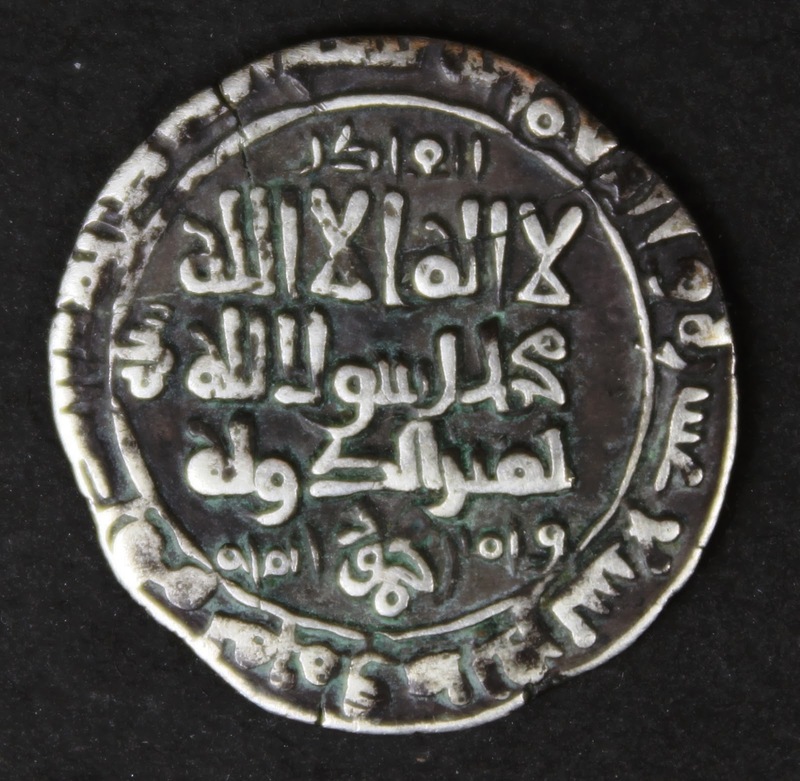 Nevertheless, given the importance of Lahore to the empire – it was virtually a joint capital with Ghazni – and the fact that in 1028 (when the coins were issued), it was governed by Mahmud’s hand-picked governor, Malik Ayaz (of Mahmud-o-Ayaz fame), the issuance of the bilingual coins and the text of the Sanskrit inscription cannot be dismissed as an anomaly. Clearly, there was an explicit and official attempt to reach across the communal divide, not only in form but also in ideas – perhaps to promote a version of the Islamic creed that would win greater acceptance among the Hindu populace. Nor was this the only such example. Mahmud’s son, Mas’ud I, also issued coins depicting Hindu iconography, including an image of Nandi, the bull of Shiva, which had been a prevalent motif in the Hindu Shahi coinage before the Ghaznavids. 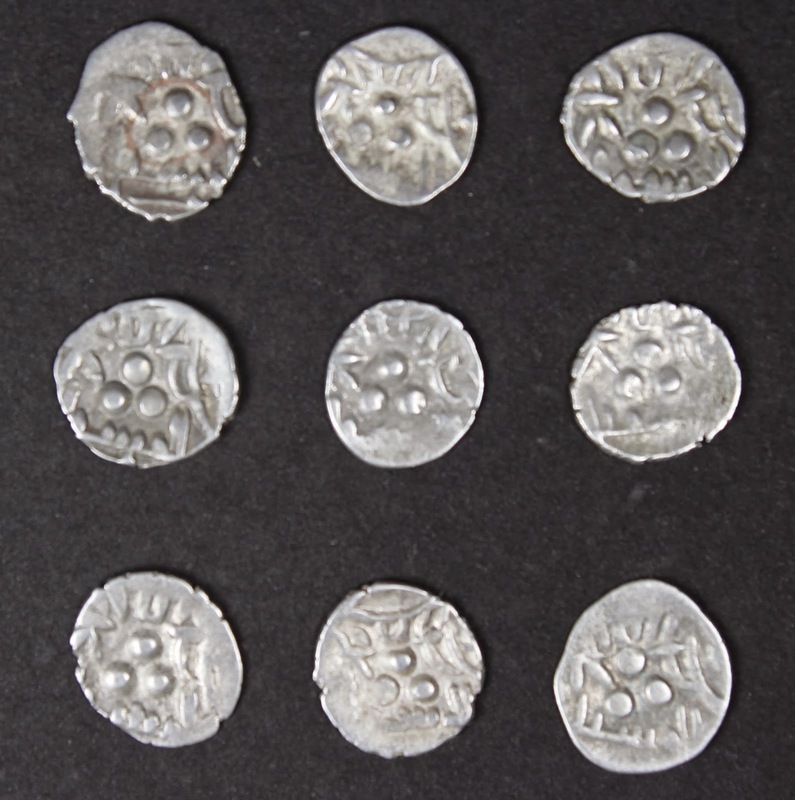 Indeed, these Hindu motifs continued to be used on Ghaznavid coins by Mahmud’s successors in clear contravention of the orthodox Islamic proscription against images. Some coins also used Sharada inscriptions naming the king and occasionally invoking Hindu deities. These iconographic practices persisted into the Ghorid dynasty as well. But the history of bilingual coinage and syncretism between Islam and Hinduism in the region goes back somewhat further, and has some ironic twists. As far as is known, the first bilingual coins by any Muslim rulers in India were struck in Multan by the Sāmid Amirs who reigned there in the 10th century. Multan was then the capital of what is sometimes called “Northern Sindh”. After the initial Arab conquest in 711, Sindh was rules by a succession of governors appointed by the Umayyad administration, and then by the Abbasids after they took over in 750 CE. However, the hold of the caliphate on Sind became increasingly tenuous, and by the early tenth century, the region had split into a southern part, ruled from Mansurah by descendants of ‘Umar bin ‘Abd-ul-‘Aziz al-Habbāri, and a northern part, ruled from Multan by the descendants of Sāmah bin Lu’ayy. Both dynasties were of Qurayshi Arab origin, and professed nominal allegiance to the Abbasid caliph in Baghdad. Multan, at the time, was famous for its magnificent Sun Temple, which was a major center of Hindu pilgrimage. The Sāmid rulers seem to have supported the temple and a tolerant, perhaps syncretic version of Islam. However, sometime in the mid-tenth century, the rulers of Multan converted to Ismai’ili Islam, and transferred their allegiance from the Abbasids to the Fatimid caliph in Cairo, who was also the Isma’ili imam. Initially, the Isma’ili religious leadership in Multan appears to have continued on a tolerant course, but this aroused the wrath of the Fatimid Caliph, Al-Mu’izz, who sent a new preacher (dā’i), Jalam bin Shayban, insisting that the Isma’ili Amir of Multan purify the local religious practice (per Isma’ili doctrine, of course), and end support of “idol worship”. In a famous incident, the Caliph, hearing that a major local idol had been destroyed by the new preacher, asked that the head be sent to him as proof of destruction. It has been believed, on the authority of Al-Biruni, no less, that this refers to the destruction of the Sun Temple and its idol, but other evidence, summarized by MacLean, suggests that it was probably another, lesser idol. Nevertheless, it is ironic that the first recorded instance in Punjab of systematic idol-breaking in the name of Islamic purity came from Isma’ilis rather than orthodox Sunnis. A second irony is that it was the Isma’ili presence in Multan that attracted the most famous of “idol-breakers”, Mahmud, to attack Multan in 1010 CE, depose its Isma’ili ruler whom he regarded as an apostate, and annex the province into the Ghaznavid empire. Apart from his religious objections, Mahmud may also have been motivated to punish the rulers of Multan for transferring their allegiance away from the Abbasid caliph, to whom Mahmud pledged nominal fealty. 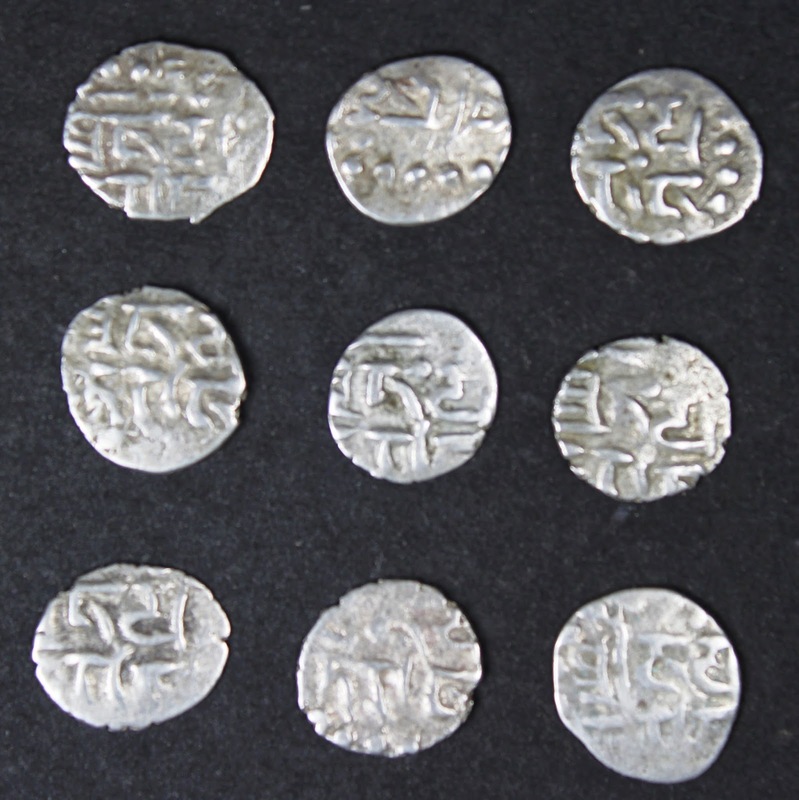 The bilingual coins are thought to be from the early Isma’ili period Multan around 965 CE. As shown in the examples from my collection (above), the text on these very small coins is usually hard to read. However, one side had the name of the ruler in Arabic (left panel) while the other often had a Sanskrit word, written in the Sharada script, with Hindu religious significance (right panel). According to Flood3, four distinct Sanskrit inscriptions have been identified – two referring to Vishnu, one to Lakshmi, and the fourth to “Madhumadi”, which is regarded as the Sanskritized version of “Muhammad” (also used elsewhere in India at the time). If this is true, the coins represent an attempt to insert the Prophet of Islam into the Hindu pantheon. Perhaps it was such practices that raised the ire of al-Mu’izz and motivated him to send a “purifier”. To summarize the sequential ironies of the situation: First, Isma’ili Muslim rulers in Multan attempted to create a syncretic culture among the Hindus and Muslims of their emirate; then they were chastised by an Isma’ili Caliph in Egypt who ordered them to destroy idols and temples – which they did; but their Isma’ili faith was still seen as heretical by the pious Sunni king, Mahmud, who invaded and annexed their kingdom; and then, Mahmud’s own hand-picked governor in the region made another similar effort at syncretic outreach, minting coins with statements that orthodox Muslims would have regarded as heretical – but only in Sanskrit! 2. F.B. Flood (2011) Conflict and Cosmopolitanism in “Arab” Sind. In: A Companion to Asian Art and Architecture, R.M. Brown &amp; D.S. Hutton (eds), pp 365-397. Blackwell. 3. F.B. Flood (2009) Objects of Translation: Material Culture and Medieval "Hindu-Muslim" Encounter. Princeton University Press. 5. J. Tye and M. Tye (1995) Jitals: A Catalogue and Account of the Coin Denomination of Daily Use in Medieval Afghanistan and North West India. John Tye. I used to be a member of the Parthian coin project a long long time ago. Is there a possibility you are overthinking the whole thing? May be, they wanted the coinage to go to people, the majority of whom could not, yet, read the Arabic script. Although the script first appeared in Sindh in 8th century, It had some traction only the beginning of 11th century. Taking Romila Thapar as reference may not be the best. She is of the opinion that Somnath, etc was popular revolt against oppressive Brahmins, and had concluded that Ghazni, Gauri and the sunbsequent slaves were sent to rescue the oppressed teeming masses from the clutches of imperialism. I reproduce entirely this paragraph from "Cultural Transaction and early India” Oxford University Press in 1987. "So we may now recognise two important themes that surface in Indian history : one, there was no single pan-Indian community determined by a religious Hindu identity in early India ; and second, that tolerance as we understand it today as a Hindu, or Indian phenomenon, did give way on occasion to extreme intolerance. Therefore, we cannot ascribe brutality, destruction and killings only to “the other” ethnic groups who came to India later, known as “Turushka/Turks, or Yavana/West Asian”, "